The Near Me widget allows you to find features within a buffer of a defined address or location, view detailed information about those features, and get directions to the selected feature. Additionally, the Near Me widget can be configured to find polygon features containing a defined address or location instead of polygon features within the buffer. You may notice the difference in buffer operation from the Measurement widget. This is because the Near Me widget uses a Euclidean buffer (planar) by default and has an option to choose a geodesic buffer. The Measurement widget, however, defaults to a geodesic buffer with no options. Pop-up media links are not honored by this widget. The click action of the link opens the full-size image instead of opening the configured link. To configure the Search Source Settings section, see the Search widget topic. The Near Me widget follows the same configuration steps. Search font color for search results—This is the color displayed in the title section of the search results. Select search layer(s)—Select a layer or layers to be configured in the widget. Search layers must have a pop-up configured. Set Location Button—Enable this option to display the Set Location button next to the search box. Click the button and click the map to set the search location. If you don't enable this option, clicking the map will automatically set the location. Only draw selected search layer results—Enable this option to only display features of the layer selected in the listed search results. Set buffer visibility—Enable this option to display the buffer. Set buffer distance—Define the default value of the buffer slider. Set maximum buffer distance—Define the maximum value of the buffer slider. Buffer distance units—Define the units used by the buffer slider, such as miles, kilometers, meters, or feet. Limit number or results—Specify the maximum number of results to return. Use geodesic buffer—Enable this option to generate a geodesic buffer instead of a Euclidean buffer (planar). 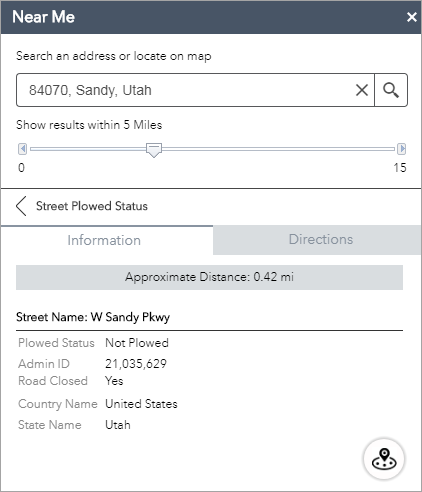 Address or location symbols—Select and adjust the symbols used to mark the search location. Zoom to selected feature—Enable this option to zoom to the selected feature and set a location instead of the buffer. Return intersecting polygon(s)—Enable this option to return the polygon or polygons containing the searched location rather than polygons within the buffer. The widget uses many elements from the map used in Web AppBuilder for ArcGIS. The list of features displays the layer names in the map, the results of each layer display from the pop-up title of the map pop-up, and the information panel displays the map pop-up. 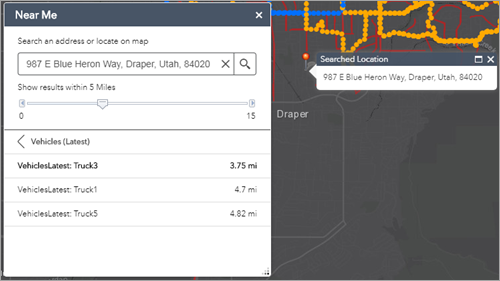 Routing Service—Click Set and browse to a routing service in your ArcGIS Online organizational account, or provide the URL to the routing service. The ArcGIS Online World Route Service consumes credits. Before generating routes using this service, on the Attributes tab for the configuration of your Web AppBuilder application, configure Subscriber content access with the URL of the routing service used by your widget. Direction length units—Select the units to display directions (kilometers or miles). Select symbol to display route—Select the display symbol, color, style, transparency, and width for the route. Routing is enabled and disabled in the application settings of the ArcGIS Online item page of the map used by the widget. Click Add New Symbols to add a new symbol. Choose a layer, field, and value for that field to represent with a graphic. Choose a symbol to represent that value in that field and that layer. This graphic will display in the Near Me panel below the pop-up attributes and above any attachments. The graphic representation of the attribute will display even when the attribute is hidden in the pop-up. To remove a graphic, click the x under the Actions column. Click New Filter and select a layer from the Layer drop-down list. Choose an icon or browse to your local images to choose an icon for the filter. The default icon is used if you don't specify one. Date-related value providers now can provide relative dates, such as today, yesterday, and tomorrow. Date-related operators, such as in the last and not in the last, can also support the setting of relative dates (for example, in the last five days). Note that certain date-related operators, such as in the last and not in the last, are only available for online-hosted feature services. The is any of and is none of operators accept multiple values of a field as input. With one of the operators, your expression can get data that matches any/none of the selected values. To filter based on a specific value, click the settings button, choose Value, and specify a value in the field. Optionally, click the box to the left of Ask for values to set up an interactive expression. Type information about the value in the Prompt field and a hint in the Hint field. Select one or more values from the List values drop-down list to use to filter the layer. To filter based on a specific value in the field, choose Unique in the settings to retrieve a dynamic list of values from the layer, or choose Unique (predefined) to predefine a static list of values. It also allows you to dynamically show the values based on the previous expressions or all other expressions regardless of their orders. Provide information about the value in the Prompt field and a hint in the Hint field, and select how the values are listed. To display descriptions for coded values when Values filtered by previous expressions or Values filtered by all other expressions is selected, the service must support the capability of query by statistics. If you created an expression based on values or a unique value, you can set up an interactive expression by checking the box to the left of Ask for values. You cannot ask for values on expressions based on a field. Under the Options tab, check the box to the left of Remove the preset layer filters from the map if you don't want to carry over the filters in the map to your app. To add another filter, repeat steps a through f.
Check the Collapse the filter expression (if any) when the widget is opened option to collapse the filter with Ask for values. Click the Near Me widget icon to open it. Define the area you want to buffer by adjusting the slider to the desired number. Search for an address in the search bar or click a location on the map to define the location to be buffered. Features found within the defined buffer for each layer are listed as well as a count of how many features belong to each layer. Click a layer in the list of results and click the desired feature. Information about the feature is shown on the Information tab. If the widget is configured for one layer, all the features found for that layer are listed. Click the Directions tab if the widget is configured to provide driving directions. Driving directions to the selected feature from the defined location are shown.